Those who are ice hockey fans might remember that Finland won the world championship this year. When the team arrived to Finland, there was a party at the town square in Helsinki (the capital). Now the local members of the national team arrived to Oulu and there was a party at the market square. Some say 20 000 people were there to listen music and scream at the players on the stage. And to listen politicians say how great everything is. I was at the city library at about 1700hrs (5pm) when I heard the organizers doing sound checks. Of course, I got curious and went to see what was going on. Empty square, a stage with some people setting up the gear and a few hudred teenage girls waiting for the sport stars. The party was supposed to start at 7pm. Meh, I'm not a sport star so I went home to have dinner. After dinner I read some, and at about 7pm I went to see if the party was worth my time. The stage is back there somewhere. This photo was taken standing on the street. Can't see anything. The street was blocked by people standing there and walking around. And the guy on the van in the right was watching the show, too. He couldn't get anywhere. This is near the stage. There were too many people so I couldn't see at the stage at all. Maybe I should've skipped dinner and stayed there all evening so I could have seen something. Here's several hundred, maybe thousands of bikes parked in front of the Theater. In two or three rows. With racks for about five bikes. I parked my bike there too, and had a little trouble finding my bike, but I found it. On the other side of the road, the bike parking in front of the library was also overflowing. I didn't go to the other side of the crowd to see if there was hundreds of bikes parked there too, but most likely there was. The police had warned that the city center was going to be full of people and parking would be full. Driving was discouraged, and alternative methods were recommended. I think the car traffic was a little lighter than normally, but there were a lot of people walking and cycling. 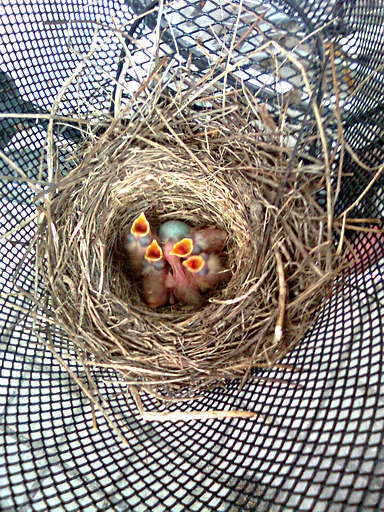 The local newspaper tells about a lady who has been unable to use her bicycle because a bird built her nest in the basket about two weeks ago. She decided to not move the nest. 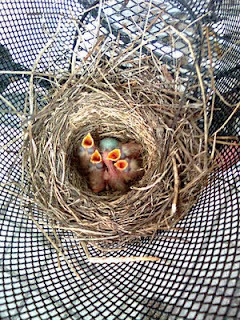 Now the eggs have hatched, and in about two weeks the new, brand new birds will fly away. I wonder if they are will grow up to be jailbirds, as they grow up behind the bars? It is possible to move the nest if you really need to, as long as you do not move it too much at a time so the parents will find the nest. Less than half a metre at a time, every few hours. So it might take several days until the nest is at a good location. Wear gloves and do not touch the chicks. The spring is making everything green. The new green grass is about 5cm or maybe 10cm tall, and trees are growing pale green leaves. The leaves are not fully grown yet, so one can see through the birches quite easily. The leaves make everything much greener. Here's a video made from a couple of rides. You can see the city is green, the weather was fine and a lot of people were going for a picnic in the parks. 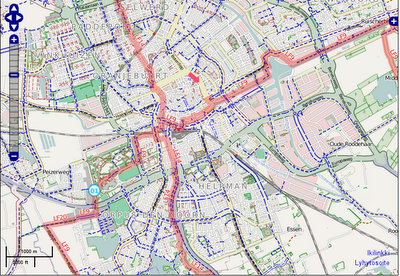 Here's a screenshot of OpenStreetMap's cyclemap showing Oulu. 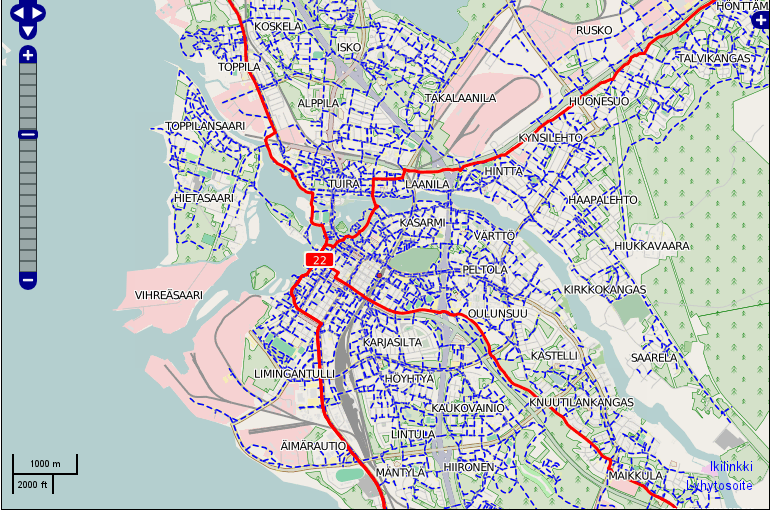 OSM has several map layers, and you can choose which is best for your needs. 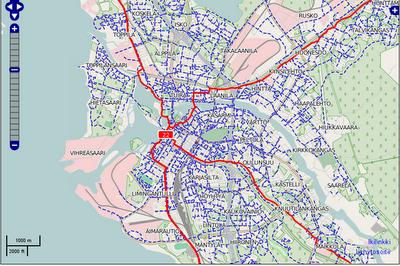 Cyclemap is obviously good for bicycling. OSM is an opensource mapping project, and it works sort of like wikipedia. Use a gps device to record your route on previously uncharted streets, upload it there, and soon the map will be updated with the new data. Not quite that simple, but almost. And the map will be up to date and will have information that is useful. Looking at the map, I can see they've added a new bike route due to construction blocking the old one. Googlemaps does not have even the old bikeway on the map! 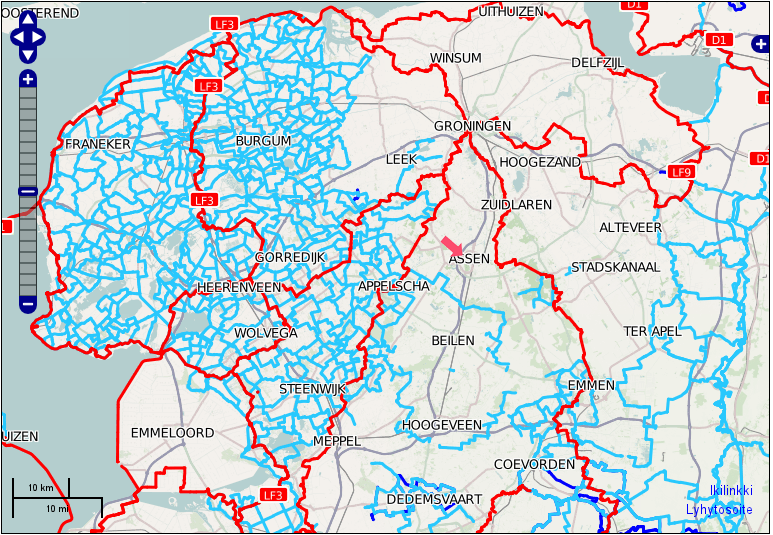 On the screenshot, the red lines are longer routes, for bike touring between towns. National Cycle Network routes, if you will. The blue lines are bikeways. 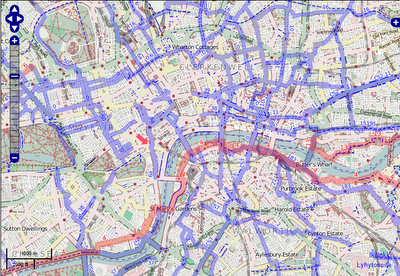 There's no difference in red or blue bikeways, the blue ones are just not part of a longer route. 'Shared' streets (quiet streets with no segregated bikeways) do not get blue lines. They're just streets. 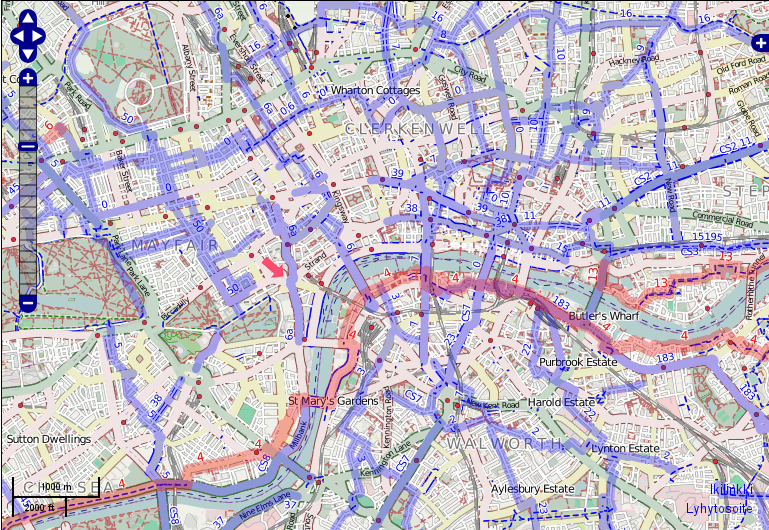 Here's London on OSM. Boy, I was surprised that they had so many blue lines on the map. I thought London was in the throes of cycling revolution with it's 1% or 2% cycling rates on their two superhighways. With this many bikeways they should have much more cyclists. The river in the middle of the map is Thames, and one of the bridges is the notorious Blackfriars bridge (Cyclists in the city has good posts about it). The Transport for London is trying to redesign the bridge, but they're having problems with the idea that they do not have to give all the road space to cars. But what can you expect when even so-called cycling experts do not know any better. That last link makes me want to cry, it's so awful. Interesting thing, that Level I-III categorisation of cyclists. Explains why the UK bloggers are talking about bike training so much. Level I can't ride a bike (has problems with balance, steering, signals etc), Level II can ride a bike but not in traffic, and Level III can ride in traffic. So if you want more cyclists, all you have to do is train everybody up to level III and the cycling revolution will begin. Simple, isn't it? As cyclists in Levels I and II can not ride in traffic, the roadbuilders can build the infra in which Level III cyclists can survive. Which is car dominated crap cycle lanes, with pinch points added just to make it more fun. How does this fit with the portlandian categorisation? It shows that only the 1% of cyclists, the "strong and fearless" like to cycle with heavy traffic whizzing by. All the rest would like or need proper cycling infrastructure. Which pretty much makes it certain that the cycling revolution will be revolutionising cycling in London at the 1% level forever. You can train cyclists all you want, it can't make crap cycle lanes any better. edit: Oops, there was Assen in the topic, not Groningen. Gröningen, Groeningen? Here's a trash pile, made by the machines in the previous post. Waiting for removal to the compost. And they had dug up the lawn, too. 'Heavy' is an aviation term. Tiny little two seaters are obviously in the 'light' category, and jumbojets are 'heavy'. 'Heavy' airplanes need strong runways and taxiways, so the surface will not crack under them. And they need long runways, too. What's going on? Had there been some kind of railway accident on the bridge above? That would explain the rubbish on the bikeway. But what is that guy doing with the hose, is he going to flush them into the drain? The drain would just get blocked. Anyway, I cycled past him and saw another 'heavy' on the bikeway. Instead of using a man with a leaf blower, they're using an excavator to brush the old leaves into piles in the middle of bikeway. You can see a tractor lurking in the background. A front loader with a brush, and water tank for washing up. That explains the tank truck, it's for filling up the tank on the tractor. Or maybe they use it to wash the bikeways, too? On my way back, the water tank truck had moved, and the tractor was scooping up the garbage and piling it somewhere. Or maybe they had a fourth machine (truck or tractor trailer) to take it away. It's not often I see such a heavy machines on the bikeways! Puncture? Problems with the chain? Some green grass- and the first signs of leaves on threes. There's no snow left, except on piles made by snow plows. But there's not much green, either. Temperatures have been between +2C and +15C. No more ice fishing gear. It's spring! Whew, that was one hell of a party. Not that it took me ten days to get my head clear and the hangover cured, I've just been busy. Here's a bunch of students gathered together for a beer. The overalls are a "party uniform." Easy to clean (the vomit off), durable (when you're falling drunk) and creates team spirit. You could identify what they are studying of by their overalls, as each class has their own colors and logos. I've no idea who these guys are, though. Broken glass bottles littering the street. All empty soda and beer cans and bottles are worth money (15 cents or so) when you return them to the shop, so you will not find many unbroken ones laying around. Someone will pick them up. Most likely someone on foot or bike. Broken bikes littering the river and parks. There's about 2000 bike thefts every year. Most of the bikes will find owners, but they'll end in the lost and found.